Description: Vervain is a perennial that growa up to 3 feet, with an upright habit. It prefers limey soils. This ancient plant has been used in herbal medicine to treat nervous problems and insomnia. It was also considered an herb of inspiration and has long been regarded as a powerful ally of poets and writers. More recently, the Pawnee Indians used vervain to improve their dreaming. 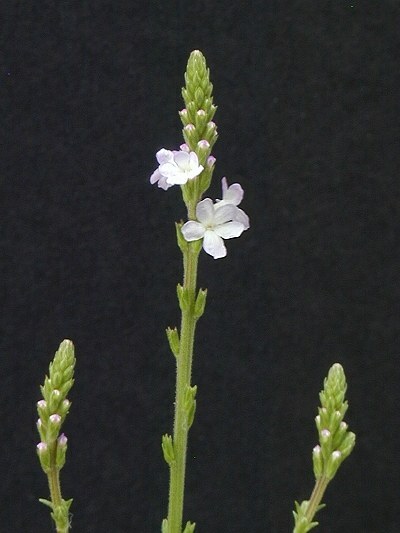 The lobed leaves are toothed, the delicate spikes hold mauve flowers.. Vervain prefers to grow in meager, dry soil, and one finds it above all on roadsides or in sunny pastures. The small blossoms are delicate, mauve to pink and grow between the hairy leaves and stems. It is in bloom from July to September. In oneÂ´s overeagerness to stand up for a good cause, one ruins oneÂ´s energy, reacts missionarily to fanatically.